A native of North East Turkey, the title photo was taken by Pontus Wallsten of this rare and delicate beauty as he found it growing among bracken on a well drained hillside in June of 2015. Pontus classifies this species as not only rare, but "almost impossible to grow". It is known to reside in only a few small localities in forest margins near Akkus in NE Turkey making it an extremely rare lily. 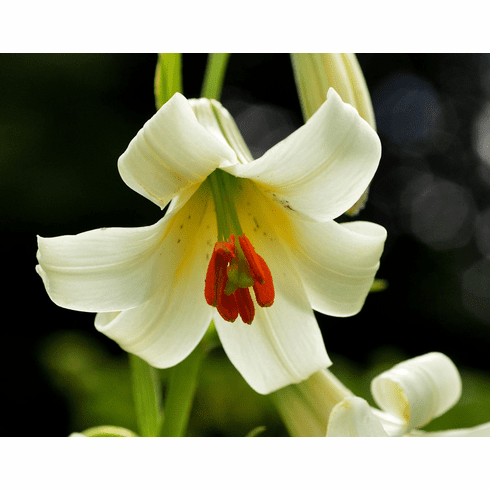 The fact that it was only recently discovered in 1993 and was only first written up and described in 1998 attests to the extreme rarity of this lily. The flowers are described to be very fragrant and while opening a pale yellow, they quickly turn white. The spots are a deep purple. A part of the L. Monadelphum group, it is clearly distinct from its near relations. To be successful with L. Akkusianum, it must have a well drained situation. Photo insert 'L. akkusianum in habitat near Akkus, Turkey. Photo taken by and copyrighted Ernst G�gel. Courtesy of WikiMedia Commons. This file is licensed under the�Creative Commons�Attribution-Share Alike 3.0 Unported�license.